Morning Pages, an essential tool from Julia Cameron’s “The Artist’s Way”, consist of three pages of A4, preferably done in the morning, and are of conscious long-hand thoughts that cross your brain as you proceed to write. Having done 12 weeks of these as part of finishing “The Artist’s Way”, you’re then encouraged to continue writing them for the next 90 days in a sort of remission like state. I’m just coming to the end of my 90 day stint and felt it warranted a blog of my experiences with them. The process of writing down everything long as it drifts across your brain to fill three pages doesn’t sound too difficult, or so I thought when I first undertook them. It’s amazing how conscious you suddenly become that you are recording EVERYTHING; soon your stream of thought dries up and you’re left writing “I have nothing else to say. Literally, can’t think of anything.” As with any skill, you adapt and actually realise it’s fine to have these drought like moments. Having a moment of having no thoughts are in fact thoughts themselves. Similarly, this method of notation doesn’t have to be interesting. You aren’t writing to impress or publish. Cameron herself describes these as the lint roller or dust buster vacuum for the brain to clear your head of clutter, and it certainly works. Morning Pages are an exercise and a safe space. Within that you’re able to achieve quite a lot in just being able to effectively have conversation with yourself – at a reasonable speed so your hand can keep up! – and you’re able to tackle any nagging matters. It’s a space where one is able to gripe and moan and never let the world see, but know you have “exercised your chimp,”, as Prof. Steve Peters of “The Chimp Paradox” would say, and cleared it from your system. Even at times you may find you have been able to debate and come to a more rational conclusion or better perspective. So what have I learnt? Firstly, that my brain manages to sub categorise huge parts of my life and keep them separate, but it’s a struggle to deal with them, and all of their must attend to issues, at the same time. Having gotten into the practise of Morning Pages I find my thoughts are a lot more comprehensible and I’m able to deal with each one much more effectively and succinctly. Having slowed down my thoughts I also find I’m a lot calmer. Not everything seems to fly into my head at break neck speed, and when things do I can analyse a lot better. Not just at a surface level too. I’m able to identify where these thoughts might have come from and how to resolve any deeper underlying issues. I’m always reminded in this of mindfulness meditations when you’re asked to consciously observe your thoughts, remarking things like “ah, there’s worry”. It has been a helpful process to not only address surface level thinking, but take into account anything deeper that may need resolution. Have I learned much about myself? Nothing too sensational or epiphanic that I didn’t know before, having now been presented with my thoughts on hundreds of pages of paper. I’m still me, perhaps a more refined version though. I do realise I tend to spread myself too thin and I’m hugely critical (of myself more than anything or anyone else). I think this a battle everyone deals with though, I’ve just not been as aware of it in my own psyche before. I’ll continue to use Morning Pages, maybe not as religiously. If I miss a day, I won’t beat myself up over it. They are a great way to organise my brain and put me in the best way to start my day. Big issues suddenly seem logical and conquerable and minor niggles are weighed up and soon vanquished. I’d recommend to anyone, provided they are happy to sit and openly write that they haven’t a clue what they are doing or why they are doing it, and don’t mind sacrificing a few trees worth of paper to do so! It’s a useful practice, give it a try. 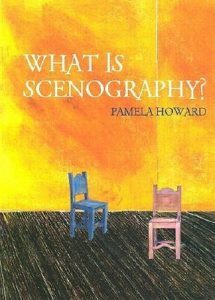 I’ve just finished re-reading “What is Scenograhy?” by Pamela Howard. I read it a few years ago whilst training as part of the reading list and it’s sat on my shelves gathering dust since. I thought now was an excellent time to revisit it. Similar to my critique of Katie Mitchell’s “The Director’s Craft” this too feels a bit like a beginner’s guide to theatre design, more cunningly disguised as an elaborate series of essays, the key point to mention though (and Howard states as such) is that she is not a theatre designer. Howard is a scenographer. What’s wonderful about this book is the subtle drawing of lines in the sand that Howard uses to show differences between theatre design and scenography. I’ve heard it being argued as the same thing amongst colleagues and peers, or rather that scenography is what theatre designers do. Having re read, I’d now like to side with Howard. The craft and practice of scenography is an evolution of theatre design, theatre design 2.0, a more holistic approach . Her arguments take scenography into a new realm of design, to that of visual storytelling and interpretation. A designer, it could be said, merely will solve the problems of and create solutions to the list of prerequisites presented by the piece. A scenographer, as presented from this read, is effectively a visual translator and close collaborator to the director – it is design in a much more applied and comprehensive manner from a greater stand point and concept. They have a deep understanding of the text, usually heavily analysed and prepared (to the extent that they could step in as director if needed, and Howard mentions having trained in direction as part of her training). They also seem to have influential say in the shape of the piece via their creations. Howard’s book is a relatively easy read and highly accessible, punctuated with some rather exquisite drawings and diagrams from her own work. The 7 working chapters focus tightly on the elements that make up her practice and could be read as stand alone pieces with very little difficulty. There is much to be gleaned from this book if, like me, you are in search of some inspiration and aspiring to develop your own practice. Read with a pad and paper by your side though, her ideas and tools are peppered randomly through the chapters and although explained well and thoroughly, if you were looking for them specifically in a focused turn-to-the-page-via-the-index-style-search you’d struggle. Controversially, I can’t necessarily say I would recommend this to theatre designers, unless those designers are open minded and willing to accept a differing opinion and view point (there may be a lot of cross over with what they already do but haven’t considered it “scenographic” by Howard’s terms). It’s definitely a good read though to other theatre practitioners, particularly those who span several disciplines and class themselves as theatre makers. Similarly, Howard’s opus would offer great insight into anyone looking to investigate visual storytelling or understanding the semiotics of putting together a visual narrative. This book has been recommended to me by several colleagues, and indeed the internet via those “if you are an artist, you should read this” style lists. I can’t say that the blurb sells this book well, in initially reading it I was skeptical. However, having been so heavily recommended and labelled a “must read”, I decided to bite the bullet and see what the fuss was about. First things first, it’s a mammoth of a tome. I read it on my kindle (purposefully for that reason, space in bag saving!) and it’s one of those books that seems to be a constant screen swiper. 50 pages later, you’ve achieved another percent and are told there’s another hour and 40 minutes left of the chapter. For anyone looking to tackle this, I’d recommend the kindle version. This is a book of two halves, and it makes itself very clear in the contents and introduction. The first seven chapters discuss the concepts of gifts, gift exchanges and definitions between commodities, products and what makes a gift. The last 2 chapters are explorations and discussions upon the lives of poets Walt Wiltman and Ezra Pound. Herein lies the ultimate problem in this book. 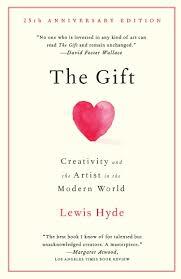 Though wordy, the first 7 chapters offer interesting insight and discussion into what a gift actually is. There is great exploration into concepts such as commodities: when a gift changes into something else, and how gifts are used in different socio-dynamics. Whilst this doesn’t quite answer the book’s main aim, to explore “the gift” of creativity, it offers interesting reading and a good study into anthropology and human nature. The last two chapters, the studies on the poets, seem to veer wildly off course and cloud the book’s focus. Pages upon pages of text that doesn’t seem relevant and more like a passion project for Hyde, the author, whose voice comes through clear in these sections. It made me wonder at times, as I trudged through this verbal treacle, as to why the editor had allowed these chapters to be left in at the length they are. When we finally reach the conclusion, things seem to wrap up nicely, with a few useful gems that I eagerly highlighted. These are not enough to really spark other inspiring thoughts for research or contemplation; their appearances are brief, thin and fleeting. Instead there is too much excessive research and emphasis on areas that don’t really answer the book’s main objective. This write up casts “The Gift” in a bad light, it’s not intentionally meant to. Perhaps it’s purpose was slightly lost on me. Despite providing information and discussion on quite a niche topic, there isn’t enough work in here discussing the effects of creativity as a gift, or the plights of artists as gift givers to feel it comprehensively fulfils its desired outcome. Give it a read, but one I would move to the bottom of the majority of reading lists. Recently I was talking to a scientific researcher over tea (yes, dear reader, what a way to start a blog!?) Being naturally curious, I asked into the ins and outs of his work and him likewise; that chat has inspired this blog. A common theme that was apparent in both our professions, in different guises, was experimentation. A major difference though: his job was to embark upon, document and share, all the possible outcomes from a question; in my work only the good outcomes ever see the light of day when an audience see the show. I hide my failures, he celebrates and shares his. Each one, to him, is a discovery. Speaking to other artists and creative practitioners here, we will all come across failure. It is inevitable in our line of work. Whether that be a declined proposal, failed audition, or a piece of work that just doesn’t seem to want to happen, failure is a constant recurring event we come across. As artists though, we keep failure relatively private. We grieve, we acknowledge where we went wrong behind closed doors to avoid judgement or criticism and we may or may not beat ourselves up over it (despite it may not being our fault). My scientific friend though had a totally opposing outlook on failure. To him, each failed experiment or attempt was a discovery in working toward the end goal – and each one had to be catalogued, documented and shared amongst colleagues! Each one, he said, presented a learning experience in gaining one step closer to pinning down the end discovery. It actually made it easier as he and his team knew where they were going wrong. Now, admittedly, it could be argued that the variables in a scientific experiment and the variables that go into creating a piece of art might be hard to compare, however it’s never going to hurt to be able to analyse what went wrong where and think what could be done better next time. Each attempt is indeed a step closer to finding out the end goal, even if that attempt doesn’t bring forth the answer we hoped for. It is likely, after we have gotten over the frustration, to learn something from it and it might spark a totally new stream of thinking and discovery. Elizabeth Gilbert in her book “Big Magic: Creative Living Beyond Fear” (which is an excellent read and a book I must review. Liz’s podcasts, “Magic Lessons”, are an excellent extension of the conversation or a great way to dip your toes into her thinking. Link here…. https://www.elizabethgilbert.com/magic-lessons/) discusses and explores failure as the process of the world asking if you want to try again. Many, in answer to this question, don’t. The pain experienced in not accomplishing their goal being too crushing to even consider attempting again. Bearing in mind the mentality from my scientific counterpart, isn’t it worth trying again, just to get that one step closer? Every step and newly gained knowledge (even if that knowledge is that something doesn’t work) is in itself is an achievement. It may not be right or what we asked for, but we know what to try next time. The universe effectively testing our determination and resolve as artists to work toward achieving the desired result. I wrote in one of my earlier blogs about why it is important to blog, and why as artists we should share. If anything, in considering this idea of failure and actually celebrating it, “I tried this, it didn’t work as I hoped, but I did learn this”, it makes me want to share even more. Every discovery may be useful to someone, and actually any insight into my process, however poor the outcome, is still enlightening. This is one of the reasons why I set out to do in blogging and engaging in conversation about my work. Ultimately, we should not evaluate work with such a black or white perspective. Labelling something as a failure almost seems to cast it aside, calls it false, wrong or incorrect. In engaging with creativity surely we just explore an idea and delight in whatever the outcome? We have created something new. Ultimately we are creative scientists, however we replace labs with our studios, desks and rehearsal rooms and their test tubes with bodies, fantastic collaborators, words or materials. We are there to engage in and explore whatever brilliant insights and experiments come our way. If they end in a failure, let us learn from them, moving on to the next as part of our journey of discovery in engaging with creativity.